Hi Everyone! I'm loving everyone's progress! You all are such an inspiration! I finished the bottom house yesterday. I ended up taking out the hearts next to the words. My friend Deb suggested it last week when we met for lunch and I like it a lot better. I'm not sure if I'm going to put something else there or not. She suggested maybe two blackbirds or something. I may just leave. I kind of like it with just the words. So pretty! I love the colors and how vivid the photo is, you have real picture taking talent there! 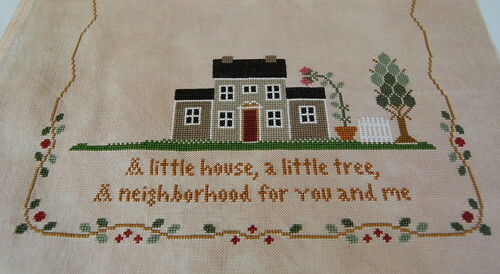 Very nicely stitched! Thanks for the update! Very neat stitches and nice colours! It blend so well with the fabric.